Composing a good survey is anything but simple. A thoughtless survey is worth little. That is why it is important to carefully consider what you would like to know, from whom you would like to know it and how you would like to get that information. We will give you some basic rules, so that you can easily come to a trustworthy questionnaire. A survey is often in support of a research. This means that if you make a research relevant, you also have to make the questions in a survey relevant. Therefore, it is important to have an objective in mind. 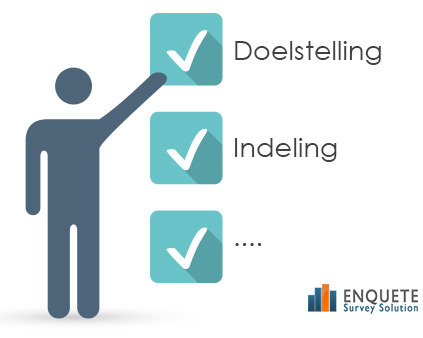 With it you can check if your survey questions are really giving an answer to your questions. if they are not, then you get “nice to know” questions - questions that are nice for you to ask, but aren’t useful for your research. With these kind of questions you would only be disturbing your respondents with irrelevant topics. Very practical: Don’t make your survey too long. If you want your respondents to finish your survey, then it must take maximal 10 minutes. This means about 20 questions. Make sure you put your survey in chronological order. Put the questions with the same topic together. A good idea would be the use of sub-questions. What also helps is to first ask general questions and then specific questions. This way the respondent will go through the questions much faster. Make the questions as short and specific as possible. Don’t use any difficult words or jargon. Ask specific questions: “How many hours did you watch tv?” Make sure that they can express it in numbers. This makes it easier to check. Avoid being suggestive. Make sure not to include the answers in the question itself. When questions are suggestive, your respondents will often confirm this by responding with a suggestive answer. Avoid asking two questions at the same time. This is often indicated by the word 'and' in the question itself. Avoid double denials. Twice 'no' in a question whether the words "no or never" can be very confusing. Make sure that the questions can be interpreted in one way: ‘Do you like sport?’ can also be seen as ‘I like watching sports’ instead of ‘I exercise frequently’. Make sure your respondents make a choice. Giving respondents scores from 1 to 4-scores will help a lot. In a five-point scale, respondents will often choose the middle therefore give neutral answers. This is not necessarily bad, but something to be aware of. Use the same scaling or scoring system as much as you can. Do you have a sensitive topic? First ask some simple questions; after answering simple questions, respondents will easily be prepared to answer more sensitive questions. Avoid asking too many open questions, because this will make a 20 questions survey take a longer time to finish. Therefore work with multiple choice questions. Are you using an online survey? Then try to use images and sound where applicable! Surveys are sometimes very boring, and in this digital era adding images and sound can make it a lot more fun. Moreover, images sometimes help to interpret questions better. First have someone else fill in the first version of the survey. This will help you will figure out if everything is clear. Make space for general comments at the end. If you have a really compassionate audience, this can lead to new and relevant insight. Be polite and write a thank-you as the closing. A smooth and personal survey where you are nicely welcomed and thanked are more likely to be filled!